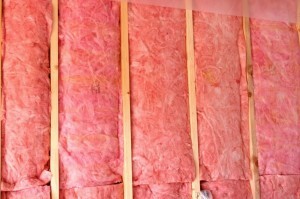 To many homeowners, insulation is simply the material used to keep winter nights just that much more bearable. They live with whatever insulation was put into their house without much consideration of the potential energy lost by poor insulation. That is where we, as industry experts come in. As home construction professionals, it is your job to impart your wisdom upon the otherwise clueless home buyer/owner. Stress that insulation is not just an important bastion against the bitter cold winter air. A simple explanation of the energy loss that can occur in a poorly insulated home should be enough to convince them of the importance of this building material. Plus, here at United Building Supply Inc. you can get the absolute best insulation around, and enable homeowners to save money on their heating and air costs this year. Ultimately, you want to be sure that the materials you install in any home are of the utmost quality. Working with underqualified materials produces a less-than-satisfying finished product. Don’t leave your next job up to chance, trust the experts at United Building Supply to help you find the best remodeling products around. At the end of the day, United Building Supply Inc. is your one stop shop for all of your building materials. We truly have it all, from windows and decking, to soffit, trim, and fascia. We are a full service provider of top notch building supplies, and encourage all builders and architects to take advantage of our great prices and even better products. For the past 30 years we have cultivated relationships with some stellar manufacturers, and we are proud to share the spoils of those relationships with you. Be sure to browse our website to discover all of the items we have to offer. Whether you are building an entirely new home to live in or looking to renovate a currently standing structure, the fact remains that homeowners enjoy having a home that is unique. Unique homes can be distinguishable by a particular room, an addition to the backyard, or even memorable doors. In the same vein, bay and bow windows give a home that extra bit of flair – that special something that sets the home apart from its contemporaries. The windows crafted by the fine folks at Marvin Windows perfectly embody that unique quality that homeowners seek out on a regular basis. 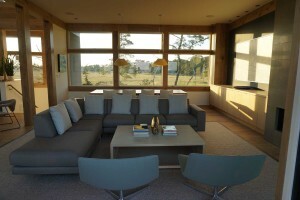 Their windows are made of the best materials and can be easily blended into the look of a traditional or modern home. A bay window gives character to the home. It allows guests to see the outside world from multiple perspectives, and gives the illusion of more space without actually sacrificing that space. A bow window is designed to let in more natural light, effectively harnessing the light from the sun to keep the home well lit. From an environmental standpoint, these two styles of window have a purpose that goes beyond their visual appeal. At the end of the day the success of your building projects hinges on the combination of proper, professional craftsmanship and quality building materials. Your customers, whether you are a contractor or a builder, will appreciate your usage of worthwhile materials in their home. At United Building Supply Inc., quality building materials is our specialty, and it is one we would be happy to share with you. Discover great building material brands such as Marvin Windows and many others by visiting us online! We can also be reached on the phone at 920-564-3888. We look forward to hearing from you! 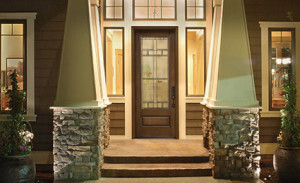 The entryway to a home is not something that homeowners give an undue amount of thought or consideration towards. Frequently it is an overlooked aspect, and the components that make up said door are as equally ignored. However, the materials that make up your door matter, and even after 25 years, one material in particular continue to be the most advanced. Fiberglass can satisfy today’s and tomorrow’s homeowners by offering the appearance of wood doors and coupling it with the strength of steel doors – without the drawbacks of either! Thermatru makes some of the best doors that feature a winning combination of security, energy efficiency, performance, and aesthetics. Here at United Building Supply Inc., we are happy to carry Thermatru, the genuine pioneer of the fiberglass door category, a truly trailblazing company. Wood doors are the original, offering a beautiful, natural look and warm feel and touch that exudes all the positive feelings homeowners associate with a warm home. Steel provides other advantages such as fewer maintenance issues, cheaper cost, security, and superb insulation value. Both of these options are surpassed by their newer, younger counterpart: fiberglass. 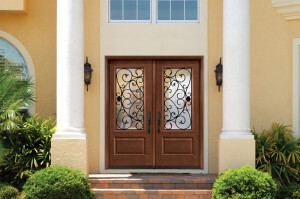 Fiberglass includes the strengths of both wood and steel doors – and then some. Unlike wood, fiberglass won’t absorb moisture, fade, or require regular maintenance. Similarly, it distances itself from steel, which is easily dented, commonly undergoes paint chipping, and experiences scratches that can lead to rust. For us, the choice has never been clearer. Fiberglass truly is the material of the future, and with insulation value five times that of wood, it doesn’t appear to be bowing out anytime soon. Whether you are attempting to tackle a massive project with multiple exterior renovations or you have just a few small tweaks to make to a home, the experts at United Building Supply Inc. are here to help. We have all the exterior remodeling products you could possibly need! Visit us online today or just call 920-564-3888 to speak with us and learn how we can help you see your projects through to completion. Whether inside a home or out, cedar is a treasured building element in many homes today. It has fantastic curb appeal that is as immersive as it is stunning. The biggest drawback with genuine home features made from cedar is the meticulous, ritual upkeep they require. One company has found a handy solution to that problem, engineering cedar-like shingles that are not only attractive but come maintenance-free too! Unlike its wood counterpart, the Foundry’s shingles never rot, warp, buckle or crack. You can offer customers a choice among a wide selection – from shingles with a subtle grain detail to staggered shakes that carry a bold rustic dimension. 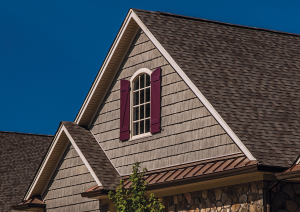 The vinyl siding offered by The Foundry presents an exact portrait of cedar shake and shingle style. The difference between the siding and real cedar is the relative toughness – this vinyl siding is tougher than wood and it is fire-resistant! In addition, this particular brand of siding is engineered for sustainability. Consider for a moment all of the wonderful benefits of vinyl siding: low-maintenance, increased product life, wind and water resistance, color retention, and impervious to insect damage…the evidence supporting the value in purchasing this siding is nearly overwhelming. High quality siding represents but one type of the exterior remodeling products that we sell here at United Building Supply Inc.. We are known for helping builders and contractors get the necessary products they need to complete exterior remodeling projects efficiently and effectively. Here you can find quality windows, doors, decking, and more, all under one roof! So what are you waiting for? Have a look at our website or give us a ring: 920-564-3888 to learn more. Here at United Building Supply Inc., we specialize in exterior remodeling products for contractors and builders. Our collection of products is recognizable by its unique meshing of both the practical and the beautiful. Each of the products we offer blends these two elements in a distinct way. From windows that let in the warmth of the sun and bring a visual dynamic to the home to doors that are aesthetically pleasing while also serving a practical purpose – we pride ourselves on carrying products that represent the best of both worlds. As any contractor can tell you, one of the keys to making customers happy is finding the delicate intersection of practicality and sheer beauty. Some of the most beautiful products for exterior remodeling are not the most practical. When you work with us at United Building Supply Inc., however, you can rest assured that each and every one of the products you use have pronounced value. The siding can enhance the shape and overall image of the home, while the right windows can light the inside of the home in just the right way. Similarly, the trim of the home brings out the paint color, while a deck is a welcome addition to just about any home! Whether you are looking to undergo a major project, or you are simply looking to make a small tweak or addition to a home – we at United Building Supply have you covered. Look to us for all of your remodeling needs: from windows and doors, to quality siding, cost-effective insulation, and the best in soffit, trim, and fascia. No matter what you are looking for, the experts at United Building Supply have the necessary industry experience and are prepared to help meet your needs. Visit us online or give us a call at 920-564-3888 to learn more about all that are practical and aesthetically pleasing in nature.